Tag line: "It's only a movie, but it's more than enough"
Produced in 1984, Terror in the Aisles is a documentary that centers on the horror genre, and features clips from some of the finest fright movies ever made. 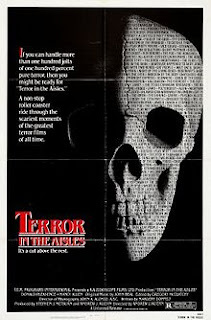 Hosted by Donald Pleasance and Nancy Allen (both of whom spend the entire film in a crowded movie theater), Terror in the Aisles covers the gamut, traveling back in time to the early days of horror with scenes from The Wolf Man, Bride of Frankenstein, 1958’s The Fly and Psycho, while also throwing a spotlight on what in 1984 were the genre’s most recent entries (Friday the 13th Part 2, Halloween 2, An American Werewolf in London, The Thing, and Firestarter). In addition to the scares, Terror in the Aisles takes a long, hard look at thrillers; there’s an interview with Alfred Hitchcock in which he discusses the difference between “shock” and “suspense”, as well as clips from such award-winning thrillers as Midnight Express, Klute and Marathon Man. From start to finish, Terror in the Aisles is a loving tribute to cinematic horror, but I have to admit that I was baffled by some of the movies that director Andrew J. Kuehn and his team chose to include. As mentioned above, there’s an extended sequence dedicated to thrillers that focuses primarily on three films: Marathon Man, Nighthawks (a 1981 crime/drama starring Sylvester Stallone and Rutger Hauer) and the underrated Vice Squad. I enjoyed this segment, even if it did feel out of place in a horror documentary, but what really left me scratching my head was the inclusion of a brief scene from Hitchcock’s To Catch a Thief (and a romantic one at that)! Also perplexing was the choice of movies used to fill each segment. At one point, Pleasance waxes poetic about the role that Satan has played in a variety of horror films, which is immediately followed by clips from what I consider the “Big Three” of devil films, namely Rosemary’s Baby, The Exorcist and The Omen). But in addition, this segment featured scenes from Jaws, Carrie, and even John Carpenter’s The Thing, all classics in their own right, but in no way Satanic in nature. Yet as confusing as its segments could be, what bothered me most were some of the clips that the filmmakers selected. In short, they spoil a good number of horror classics, highlighting the final scenes from such movies as Psycho, The Exorcist, Rosemary's Baby, ’78’s Invasion of the Body Snatchers, Halloween 2, and David Cronenberg’s Scanners, just to name a few. Normally, a movie like Terror in the Aisles would be the perfect film to show a new fan of the genre, as a means of introducing him or her to some of horror’s most time-honored motion pictures, but with so many spoilers crammed into its 84-minutes, I’d recommend that novices avoid this documentary completely. For the rest of us, though, Terror in the Aisles is an entertaining love letter to the best of what horror has to offer, and even with its flaws I found it to be a refreshing, fun-filled walk down memory lane.